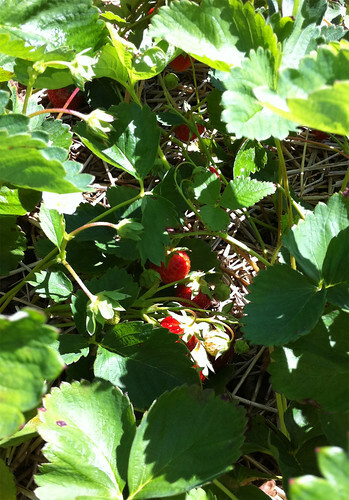 We headed up to Applewood Farm in Stouffville, and although we were warned that it was nearing the end of the strawberry season, we were still greeted with a field of beautiful bright red strawberries. Go stand in the middle of strawberry field and breathe in deeply. One of the best scents you’ll ever smell in your life! 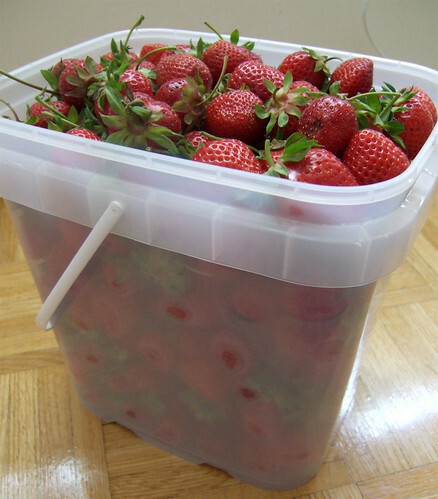 Picking strawberries is like going on a treasure hunt. You need to take your time and sift your way through the bushes to find the perfectly ripe, red, unbruised and unblemished strawberries. Look a little closer and you can even find some really large gems. However, I was also reminded of the fact that I am no longer 4 years old—I'm certainly much farther from the ground at my adult height now, and I definitely felt it in my back and knees after an hour of crouching on the ground. It took about an hour to fill my large bucket to the brim. In between picking, I taste-tested a few strawberries myself and they were divine. Unlike any strawberries I’ve had recently, even the local ones I’ve bought at the farmer’s markets. I found the strawberries I’ve bought of late have been rather tasteless and watery. But these strawberries were nothing like those. 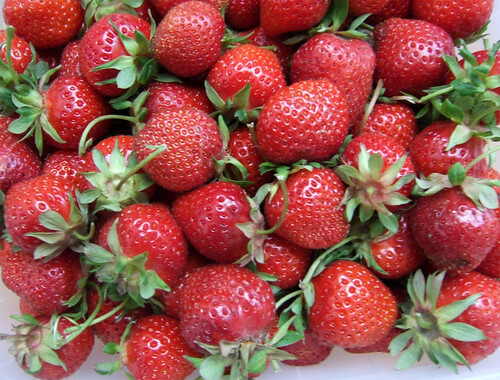 Sweet, juicy, full of real strawberry flavour, and still warm from the sun. Heaven. Ah, these are the memories of my childhood! With such a large haul of strawberries, I would normally turn most of it into jam, but I saved a few on the side to try these Strawberry Shortcake Cookies. 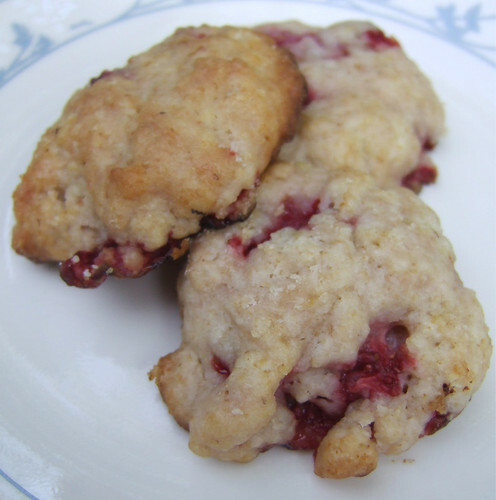 I love strawberry shortcake, but sometimes having a whole shortcake is just a little too much, but the thought of enjoying the flavours in the form of a cookie totally appealed to me. At first, I thought the cookies were a bit of a failure—they came out of the oven much too cakey for my liking due to the excess moisture of the fruit. But after sticking it in the oven to bake a few minutes longer and allow the fruit and cookie to dry out a bit more, it turned out all right. While you get the best texture fresh out of the oven (flaky and crispy on the outside, chewy on the inside), I find you get the best flavour the next day. I'm thinking these would be so good with some excellent vanilla ice cream sandwiched in between. For my next batch, these bad boys are definitely being turned into ice cream sandwiches! In a bowl, combine strawberries, lemon juice, and 2 tablespoons granulated sugar. Mix to combine and set aside. In a separate large bowl, whisk together both flours, baking powder, salt, and remaining granulated sugar. Cut in the butter with a pastry cutter, or rub in with your fingers, until mixture resembles coarse crumbs. Stir in cream and vanilla extract until dough starts to come together, then stir in strawberry mixture. If the dough appears too dry, dribble in ice cold water, 1 teaspoon at a time, until it starts to come together. Drop dough by large tablespoons, about 1 1/2 inches, onto baking sheets lined with parchment, spacing evenly apart. Sprinkle with sanding sugar, if using, and bake until golden brown, about 18 to 20 minutes. Transfer to a wire rack and let cool. Cookies are best served immediately, but can be stored in an airtight container at room temperature for up to 1 day. Bonnie Lui July 11, 2011 at 8:52 p.m.
Will definitely try this recipe! I love soft chewy cookies and I find it hardest to keep the softness the next day. Suzanne Gardner July 18, 2011 at 10:54 a.m.
Oh wow, those look fantastically delicious! Definitely need to try that recipe.